Rex's exclusive Rex Art Watercolor Painting Gift Set for 2016 is back, and better than ever! This set is chock full of an amazing selection of watercolor supplies at a ridiculously good value. You know at Rex we are all about the best values while also meeting our strict quality standards. You can be confident that our Rex Watercolor Gift Set will deliver on that promise! The Daler-Rowney Aquafine Watercolor 10 Tube Slider Set is extremely cool - featuring 10 tubes of Aquafine watercolors, a great traveling box with a built in palette, and a watercolor brush to boot! 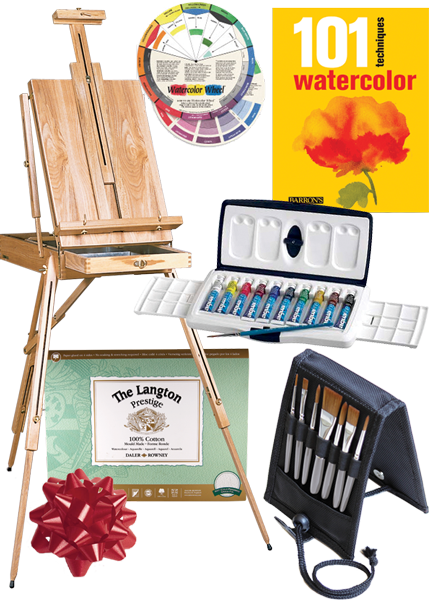 The Richeson French Easel is by far our most popular easel ever, and has proven to offer an unbeatable mix of design, reliability, and function. 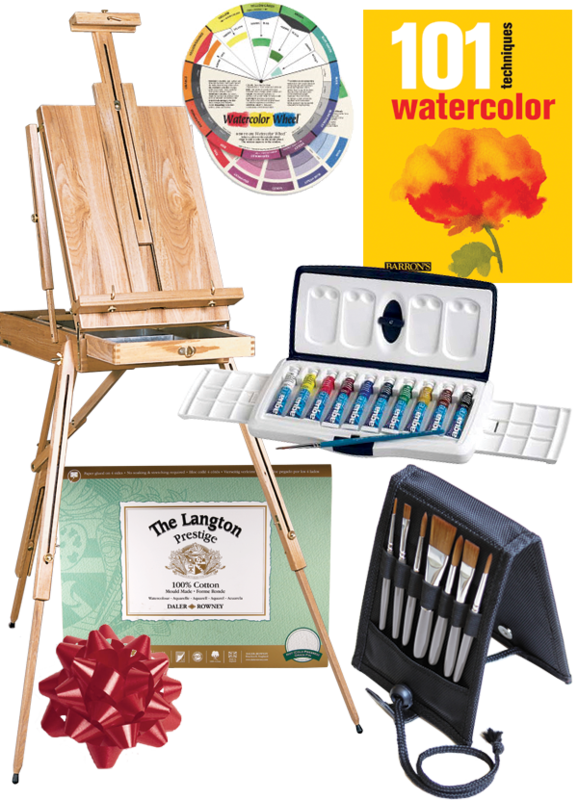 Quite simply no other easel offers more value for the dollar, plus you can take it take it out on painting excursions during the warmer months! The Plein Air Travel Brush Set by Jack Richeson has been designed for artists working in watercolor who love painting outdoors as much as painting in their studio. The shorter than traditional handles are designed for ease of close work while sitting in a chair, on a beach, or while perched on a rock when hiking! This set features seven high quality, golden taklon watercolor brushes, in the perfect assortment of sizes to get you started. This brush set also comes in a high quality case that safely keeps the brushes together and features an adjustable interior which allows the brushes to stand when in use. Everyone that is starting out in any painting medium needs inspiration, good instruction and some color mixing theory that is why we included theBarron's 101 Techniques: Watercolor Book and the Watercolor Wheel. Most sets might include a sparse leaflet, but the Barron's 101 Techniques: Watercolor is loaded with great information to help the beginning watercolorist get the information to start on the right track, with step-by-step instructions for a multitude of techniques! The Watercolor Wheel helps a new watercolor artist understand color mixing, which can be very frustrating when first learning to paint and mix colors correctly. Lastly is the Langton Watercolor Block, which is a high quality paper designed specifically for watercolors that will take away the frustration of working with a lower quality paper usually included in beginner sets (and often hinders beginning watercolor painters). The block format is also a nice format to paint with, because it is glued on the sides to keep the paper flat while painting. Remember you will not see our Rex Art Watercolor Painting Gift Set anywhere except at Rex Art, and it is offered at a fantastic price just for the holidays with Free Standard Shipping! We build our sets from the heart, and we only include the best of the best products from our inventory of over 20,000 art supplies. We know you are going to love giving these sets as much as we love creating them. These always sell out early in the season and are available in limited quantities so don't delay and order now! We hope you enjoy using or giving our Rex Art Watercolor Gift Set as much as we enjoy making them! Let us know how you like it by e-mailing us. Daler-Rowney The Langton Prestige Watercolor Block - Size: 7" x 10"
Please note: Contents may vary slightly due to availability. Any substitutions will be of equal or greater value than the listed item.